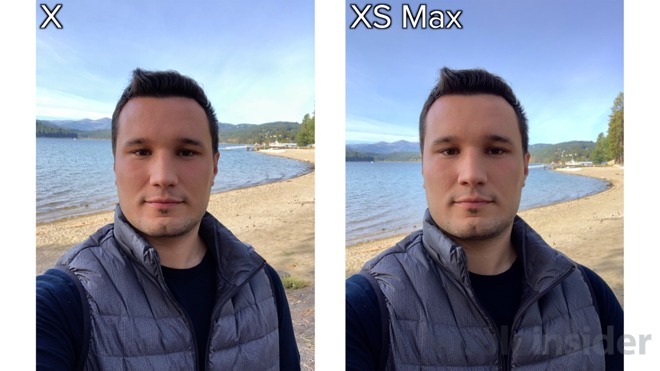 We decided to take our iPhone XS Max and iPhone X to Couer d'Alene, Idaho and snap some photos to see how much the camera actually improved. Starting off with a selfie photo in harsh lighting conditions, both phones fared well. 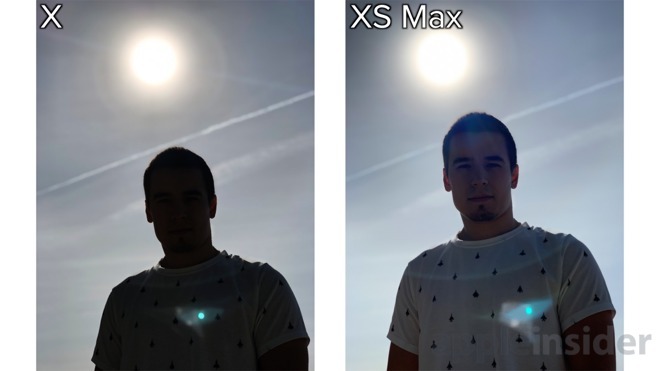 The iPhone XS Max did have better dynamic range. Some of the color in the sky is washed out on the iPhone X. 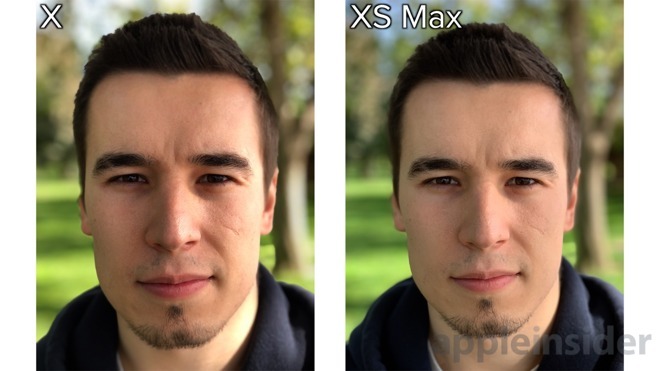 Taking a closer look, there's more detail with the iPhone XS Max as well. Shooting against the sun, the iPhone XS Max does much better in terms of dynamic range. It's also able to bring more color into the photo. In a portrait mode photo against the sun, the subject's face on the iPhone X image is extremely underexposed. On the iPhone XS Max, there is clearly more detail of not just the subject, but the surroundings. Both phones do a great job with dynamic range and sharpness. 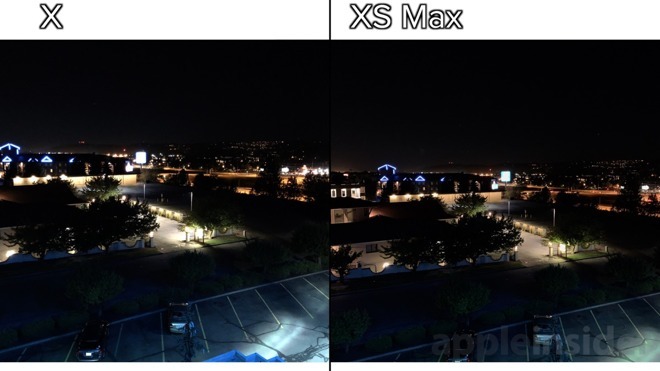 Interestingly, the iPhone XS Max wide lens has a wider field of view than the one on the iPhone X, given the same distance from the subject, and same zoom. In this photo, we also see some pretty major improvements in dynamic range. 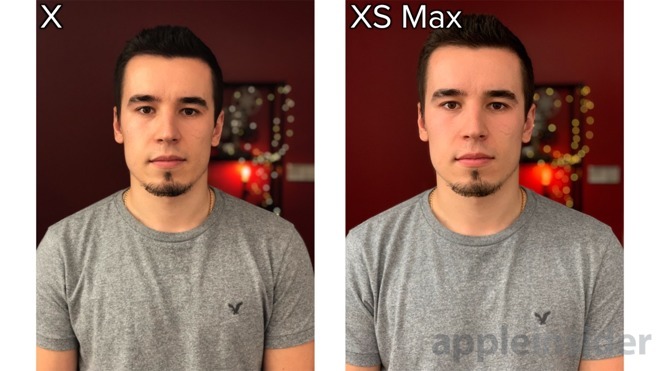 The arms have a more linear exposure on the iPhone XS Max, even though the exposure of the background is the same with both phones. 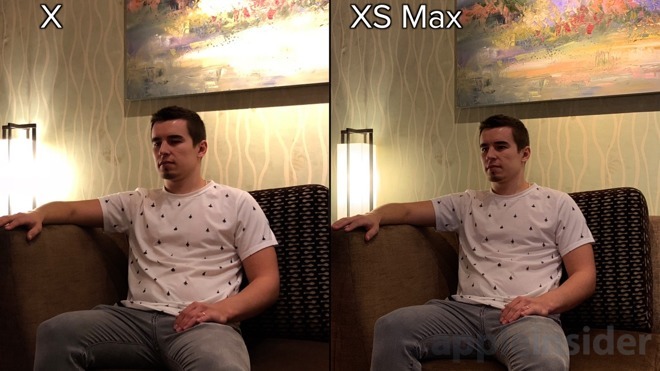 With the new depth control feature on the iPhone XS and iPhone XS Max, we can now adjust the depth of the background. This also adjusts bokeh as well, which we'll show you a bit later. The default setting is F4.5, but turning it up to F2.8 makes a decent improvement in blur. 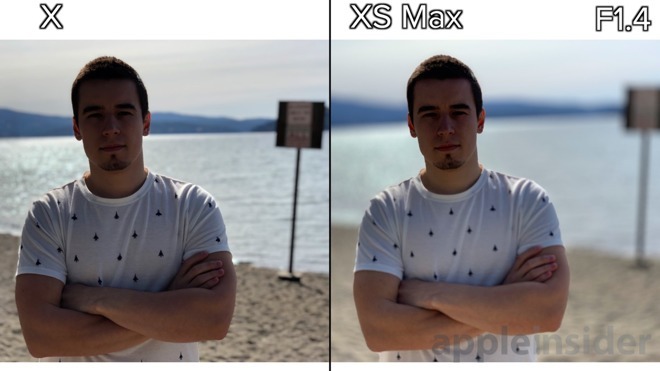 F1.4 is the maximum and it really makes the photo stand out compared to the photo array taken on the iPhone X.
Apple's new depth control feature has an extremely wide range of adjustment from F16 to F1.4. This is much wider in practice, compared to other phones like the Samsung Galaxy Note 9, which can only go from its own zero to seven scale in terms of background blur, which we're guessing is about F10 to F2.0. Even images of objects like a wooden post can look better when the blur is turned up on the XS Max. Here's the maximum distance at which you can snap a portrait mode photo. 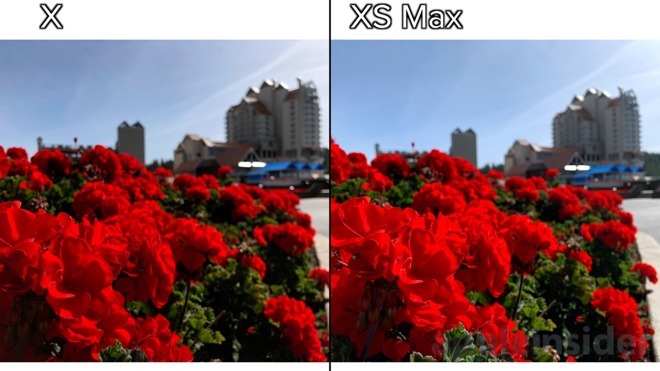 There is also a massive difference in dynamic range. The background on the iPhone X is extremely overexposed. The iPhone XS Max easily keeps the photo balanced and maintains all of the detail. The shots we took are very near to the minimum range at which you can take a portrait photo —and is uncomfortably close. 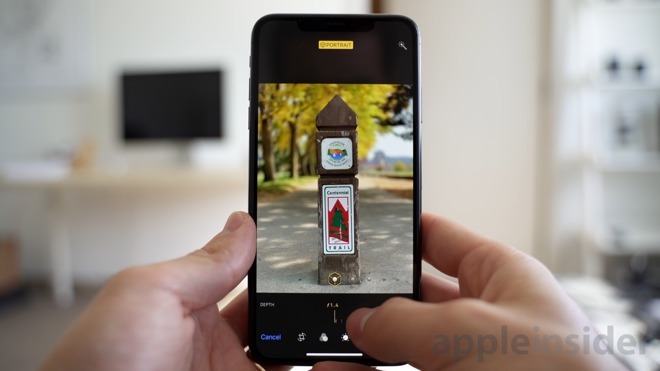 Selfie portrait mode photos look great on both the iPhone X and iPhone XS Max, with the iPhone XS Max delivering more detail. You can adjust the depth on selfie portrait photos as well, which is something you can't do on other phones like the Galaxy Note 9. With low-light portrait photography, much more color comes through on the XS Max. Even though the iPhone XS Max white balance is cooler compared to the iPhone X, the bokeh on the iPhone XS Max is warmer, closer to how it actually looks. 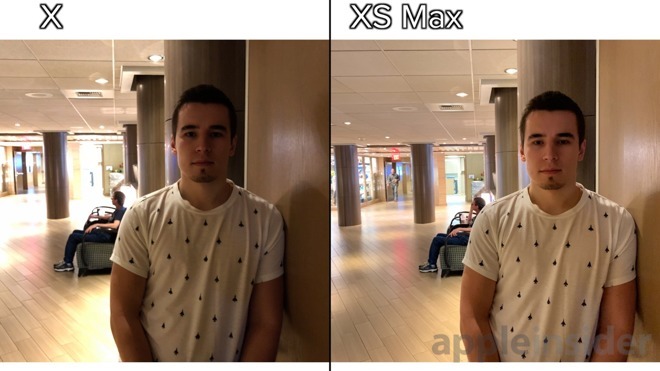 We noticed that the iPhone X had drastic exposure changes while the iPhone XS Max adjustments were very smooth, and hunted for the optimal pointless. 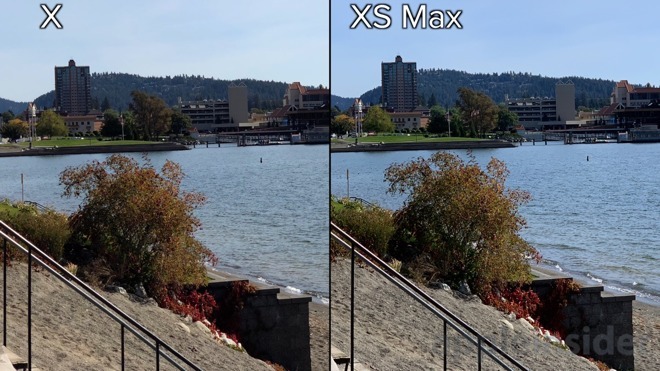 Not only that, but the dynamic range on the XS Max was many times better than the iPhone X during this test. While shooting some up-close photos of plants and flowers, the detail looked similar on both phones. 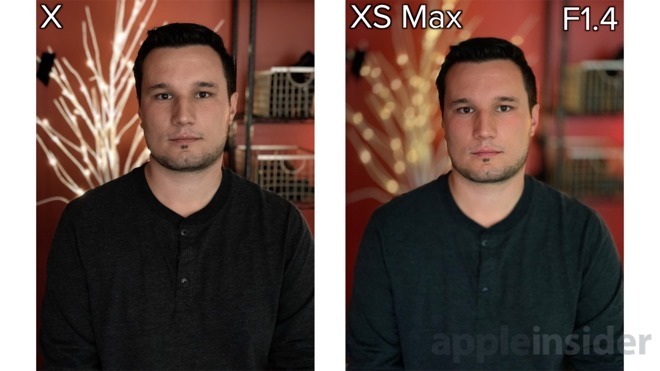 However, the iPhone XS Max images seemed to be more balanced and a bit flat compared to the iPhone X photos, which had more contrast which made them look more detailed. 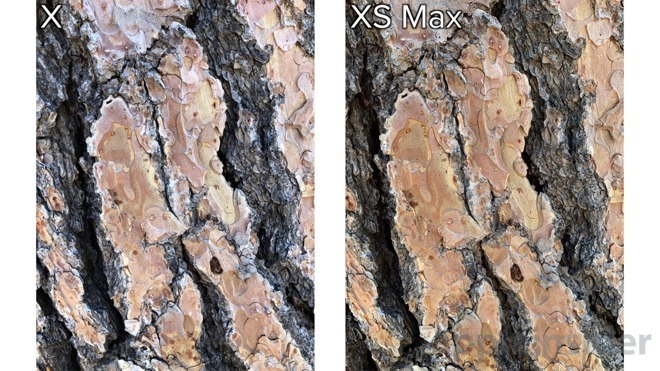 In a close-up shot of a tree, the iPhone XS Max had extremely accurate white balance, where the iPhone X's photo looked too cool. 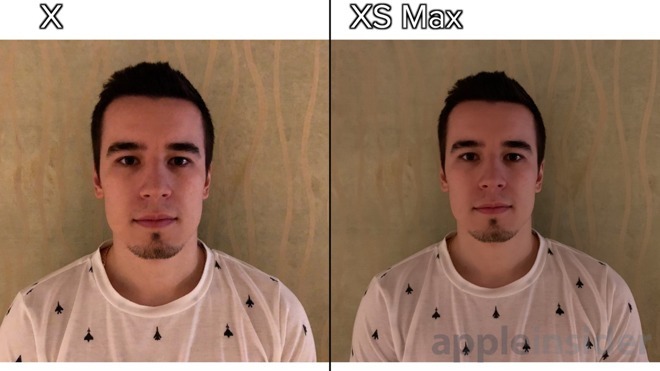 We also noticed much more detail with the iPhone XS Max as well. 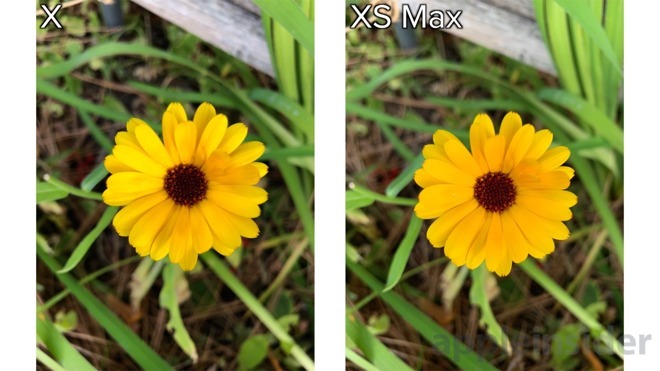 In wider detail shots, the XS Max produced more vibrant colors on flowers and in the sky, while maintaining the great dynamic range. With the telephoto lens, there were significant improvements in detail as well. The XS Max continued to bring out more color in the sky and plants than the iPhone X was able to. 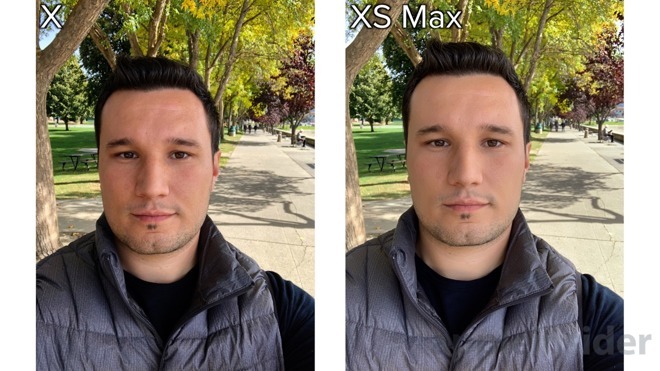 With a regular selfie photo, both phones did great in dynamic range, but the iPhone XS Max had much more detail in the face, so we can see that detail was improved all around. Moving indoors, we see an even bigger difference in dynamic range. As you can see in this photo, the lamp and the painting are extremely blown out on the iPhone X. 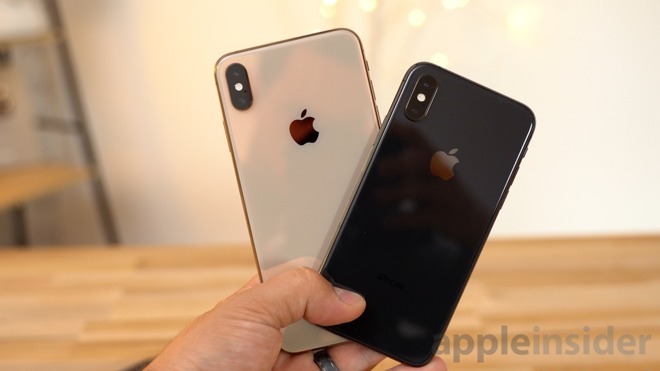 Not only that, but the iPhone X is applying far more softening to the image than the iPhone XS Max, which you can see on the pants. The iPhone XS Max is showing incredibly great dynamic range, and you can see every little detail on the painting. An even bigger difference in dynamic range was demonstrated in a dark environment with very bright lights at a distance. 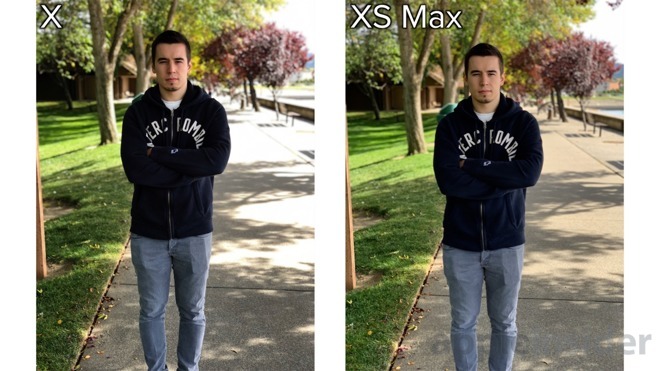 The iPhone XS Max's photo was more balanced overall and you could see more color and detail in the background. We found the darkest spot we could find and snapped a photo. 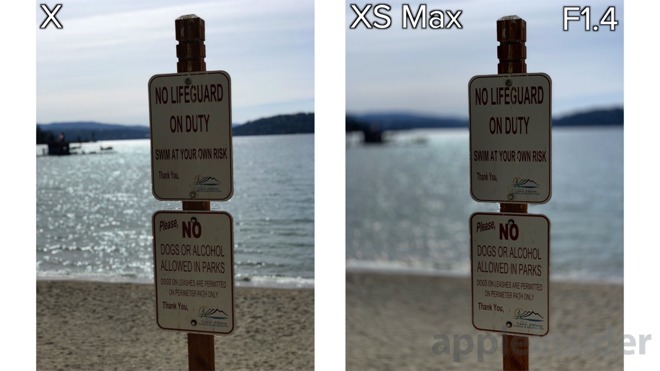 There was noticeably less noise on the iPhone XS Max's image, and it has much more detail. 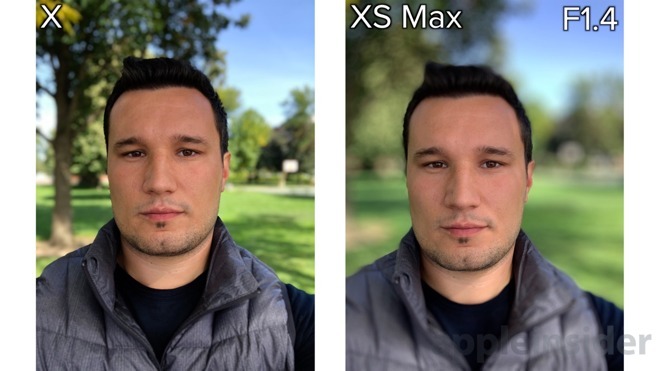 We can also see how much wider the wide lens is on the iPhone XS Max than the iPhone X. Later on in the evening, we snapped a photo of the night sky with buildings and bright lights in the foreground. 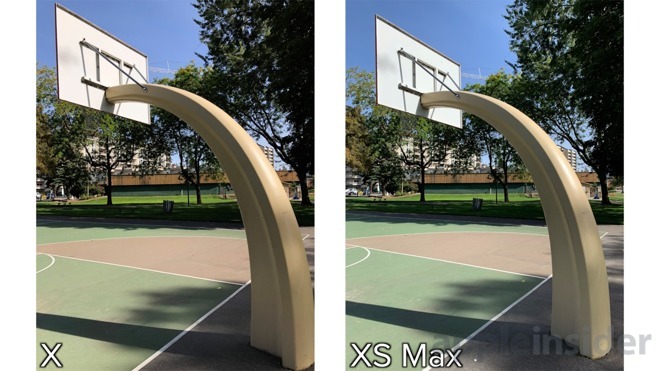 The iPhone XS Max did better in terms of dynamic range, but we're still not completely happy with it. Finally, we snapped a low light portrait photo in the office to compare blur. The colors of the bokeh on the iPhone XS Max were true to life and the tree was properly exposed. After adjusting the depth on the iPhone XS Max to F1.4, the bokeh looks even better. You can easily tell how Apple is warping and rotating the bokeh balls depending on location in the frame. However, one downside to increasing the background blur is that any issues with blur edging become more noticeable. 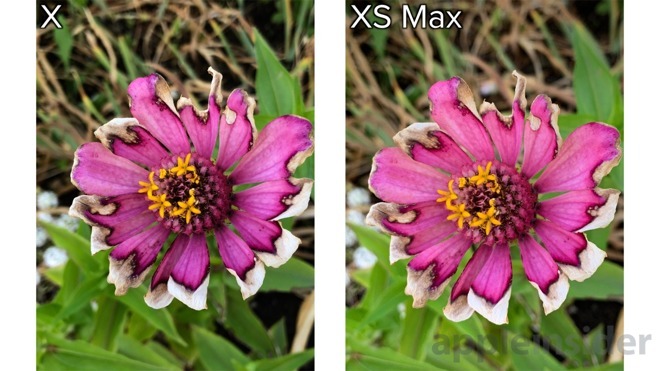 Overall, we're extremely impressed with the camera changes that Apple put into the XS & XS Max, after not originally expecting much in the way of differences in performance. 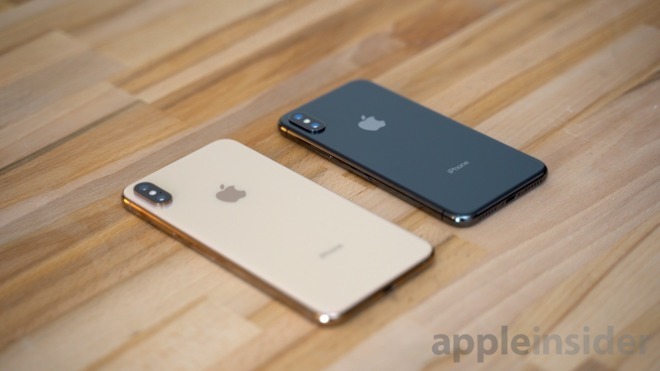 Given this performance increase, upgraders coming from an iPhone 6S or iPhone 7 Plus —the market Apple appears to be shooting for the most —will see a monumental increase. Those interested in saving $100 on the iPhone X can also do so at Verizon Wireless, AT&T Wireless, T-Mobile and Sprint.